Fuel station security stickers are designed to protect against identity theft, but the NBC4 I-Team found that the protection provided to customers depends largely how well those stickers are monitored. The red stickers on fuel pumps show evidence of tampering when broken, possibly by identity thieves using credit card skimmers to obtain customers' personal information. A broken sticker shows the words "Void Open," meaning customers should report the possible breach to a gas station employee. The system provides little reassurance for Hannah Carney. On a recent visit to a Burbank fuel station, Carney saw a sticker with the words "Void Open" and followed the instructions. "When I went in to go tell the person who was working, I saw other stickers had been ripped off or said 'Void' on them as well," Carney said. "I told him and he said, 'I don't know what you're talking about.'" The I-Team visited the station and found several stickers that read, "Void." The manager told an NBC4 photographer that the machines had not been breached — he just forgot to replace the two worn-out stickers. The I-Team visited other stations in Burbank and Studio City that also had pumps with stickers that read "Void." Other stickers appeared to be crumbling with age. "It's just a false sense of security because, even when they apparently say 'void' all over them, no one's doing anything about it," Carney said. The I-Team also discovered that anyone with a credit card and mailing address can obtain the stickers. An NBC4 I-Team producer purchased 500 stickers for $69 using a link provided on the National Association of Convenience and Fuel Retailing website. "It sounds to me like the fact that the thieves can get the stickers is a major problem with this whole process," said consumer attorney Stuart Talley. "The stickers really don't provide any security at all." The National Association of Convenience and Fuel Retailing provides an instructional video that shows how to properly install the stickers. 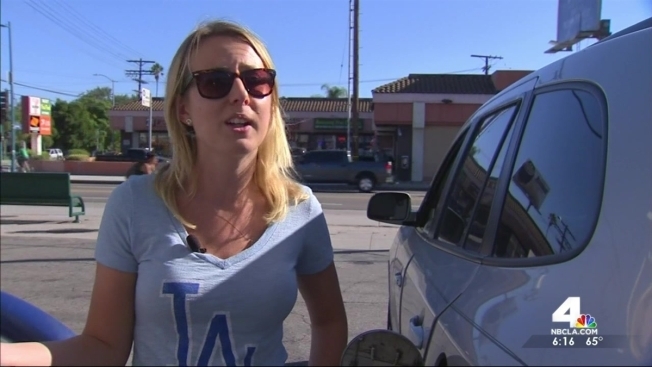 The manager of the USA Gas Station Carney visited in Burbank told the I-Team he gets the stickers from parent company Tesoro and tries to check them daily. Tesoro Statement: "Tesoro has installed unique locks on all of our company owned sites to prevent unauthorized access to our dispensers. We have strict protocol and safeguards for these locks. We do provide 'We Care' stickers to our company owned facilities at no charge and suggest that operators check the dispensers daily. We believe the stickers provide an additional benefit as they involve the customer, along with site personnel, in oversight and reporting." Chevron Statement: "Chevron takes the prevention of fraud very seriously, and places a high priority on security at service stations." •	Seals on pump access doors are a first layer of protection to allow trained station operators to spot signs of tampering. •	The Chevron and Texaco seals may only be purchased from an approved vendor by authorized buyers. These seals are used at Chevron-owned locations and we promote their use at independent retailer-owned branded stations by subsidizing a portion of the cost. •	In addition, Chevron and Texaco pumps in Southern California are equipped with reinforced locks for added protection.